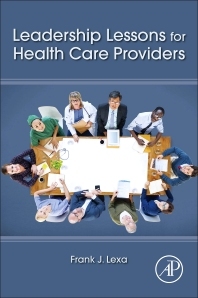 The rapid changes in health care including novel technologies as well as the changing economic, political, and social landscapes are all forcing physicians as well as most types of health care practitioners to re-think their role in leadership. This is particularly true in the US in recent years, but the same issues are widely prevalent affecting health care workers around the globe. Developing capable medical leaders who can navigate these challenges will be essential. Physicians and other health care practitioners usually receive little or no leadership training in the course of their education. At the next steps in their training: internship, residency and fellowship, gaining clinical acumen takes precedence over developing other skills that are at the core of leadership training. Leadership Lessons for Health Care Providers will allow all types of health professionals to gain a better understanding of what leadership is, how to develop their skills while still early in their careers, how to understand and handle common leadership conundrums and chart a path towards increasing their leadership capabilities as they reach mid-career and beyond. This book will provide a great start for those who are interested in learning more about leadership and includes recommendations for next steps at all stages in leadership work. Does Leadership Matter to Healthcare Professionals? Who Should Lead in Healthcare? Bringing back grades: how do you implement this? So I know what to do as a leader, why can’t I get it done? What are the hard decisions? Is there really a problem and how important is it? What do I want to encourage and why?